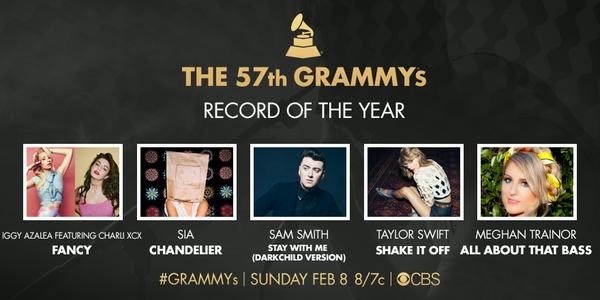 The Grammys nominations for the 2015 Awards started today with Pharrell Williams and Ed Sheeran announcing the list for the first four categories on "CBS This Morning." Both of them received nominations in the pop and urban categories, as well as Taylor Swift and Iggy Azalea for record of the year. Below is the list of categories and nominees thus far. Additional nominations will be revealed during the day, with the Album of the Year finalists being unveiled during "A Very Grammy Christmas" this evening on CBS. Lecrae, "All I Need Is You"
Basement Jaxx, "Never Say Never"
Little Big Town, "Day Drinkin'"
Miranda Lambert and Carrie Underwood, "Something Bad"
Arctic Monkeys, "Do I Wanna Know?" Tenacious D, "The Last in Line"
Marsha Ambrosius & Anthony Hamilton, As"
Antonique Smith, "Hold Up Wait a Minute (Woo Woo)"